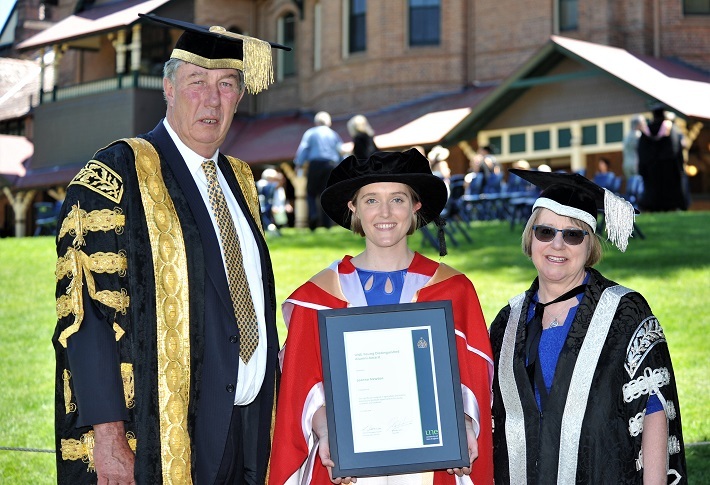 Image: Dr Joanna Newton Young Distinguished Alumni Award winner with Chancellor James Harris and Vice-Chancellor Annabelle Duncan at the 2018 Spring Graduation ceremony. UNE has announced the winners of this year's prestigious alumni awards, recognising graduates making a significant impact in their professions and communities here and overseas. Three Distinguished Alumni awards have been given in 2018 - to Om Harsh, Additional Pro-Chancellor of Glocal University in northern India; Pakistan-based education, gender and policy expert Bushra Rahim; and Emeritus Professor of Econometrics at the University of Melbourne, William Griffiths. 2018 Young Distinguished Alumni are dairy industry research scientist Jo Newton and agricultural industry investment profession Andrew Duver. Director of the Office of Advancement, Communications and Events at UNE, Robert Heather, said the calibre of applicants this year was particularly high, with the successful alumni holding very influential positions. "Alumni from UNE are often leaders in their fields of endeavour and communities, and their success reflects the quality of education they have received at UNE," Robert said. "Our graduates may have degrees from several institutions and be making a profound difference in their countries, but they're keen to maintain an ongoing relationship with UNE. This is our way of recognising their hard work and commitment." The Distinguished Alumni Award is presented to a UNE graduate who displays outstanding leadership, professional and human qualities, and contributes to their profession, business and/or community at a local, national or international level. The Young Distinguished Alumni Award is presented to a UNE graduate 30 years or younger who demonstrates outstanding professional achievements and/or community involvement likely to be an inspiration to the next generation of graduates and the community at large. "We welcome nominations from graduates, staff or UNE Council members for our 2019 awards," Robert said. "So if you hear about UNE alumni doing amazing things, nominate them."